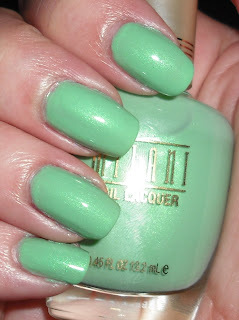 Milani Dress Maker is a color that came in the Haute Value Collection in summer. This is said to be dupe of Chanel Jade. I think I've only bought into higher end polish hype once with Deborah Lippmann Across the Universe. It was well worth it! No regrets! I've never been moved by another other high-end colors. It has to be super amazing, non-dupable, and non-frankenable for me to really want it. When you're on a budget you have to be picky! That is just me though. I never bought into the Chanel Jade craze because lighter greens tend to look pretty bad on me. I did however buy into the Milani Dress Maker is a dupe to Chanel Jade hype. I guess there is an appeal of having a dupe to a $20+ shade. You feel like you accomplished something buy saving a ton of money. I couldn't find this in stores so I bought this online. I wanted it that bad. Unfortunently, as beautiful as this shade is, it definitely is not my color! Dress Maker is a jade/mint yellow toned light green with a subtle green shimmer. There is no denying how beautiful this shade is. It just clashes with my skin horribly. At least I think so. Blech. Greens and I already have a rocky relationship, so it doesn't completely surprise me. Oh well! Speaking of Milani...have you noticed Milani hasn't released a new nail polish collection in a couple months? Milani was cranking out new collections in summer. I can think of at least 5 collections released over the summer by them. I haven't see anything since. I'd love a holiday or winter collection by them. They always release really great shades. Milani if you're listening you have a customer who wants a winter or holiday collection! That is a beautiful shade. I love minty polishes! I have yet to see Dress Maker in stores! Its driving me crazy! I love these types of colors! Looks nice on you, also! I've seen this color around the blogs but I've never really wanted it until I saw your pics. I've never noticed the shimmer in there - so pretty!! Thanks for adding to my lemming list. LOL Oh, and I know what you mean about the satisfaction of having a high-end dupe for a not high-end price (I picked up OPI's The Show Must Go On..a dupe to MAC Bad Fairy). God, I've been looking for this color everywhere! It's like a unicorn, I swear. I can't order it online so I'm quite sad, it's so pretty. I really want to get this color because it is a dupe of an expensive polish. That's the only reason. I have a tenuous relationship with greens too. Mint greens are usually the worst...they make me look like I have red scaly alien skin. Bleh! minty fresh! this color's on my wishlist but i haven't seen it in stores or on cherryculture.com! lucky you! I think your being hard on yourself, this looks stunning! Girl, I had the exact same experience with this polish, although I think it looks like 10x better on you than it did on me. And I didn't notice that Milani was asleep until you just mentioned it. But yeah, I agree. I hate to break it to you, Megan, but TSMGO isn't a Bad Fairy dupe. The only dupe out there is a European brand called Accessorize in Pink Spice. TSMGO is lighter and redder. Bad Fairy is darker and has more of an orange or rust tint to it. Oh and I was thinking the same, Steph, where are any new Milani collections??? I love glass fleck and hope they come out with some new ones soon. They do them so well. Ooh, this is really pretty! I do hope Milani comes out with a new collection soon.